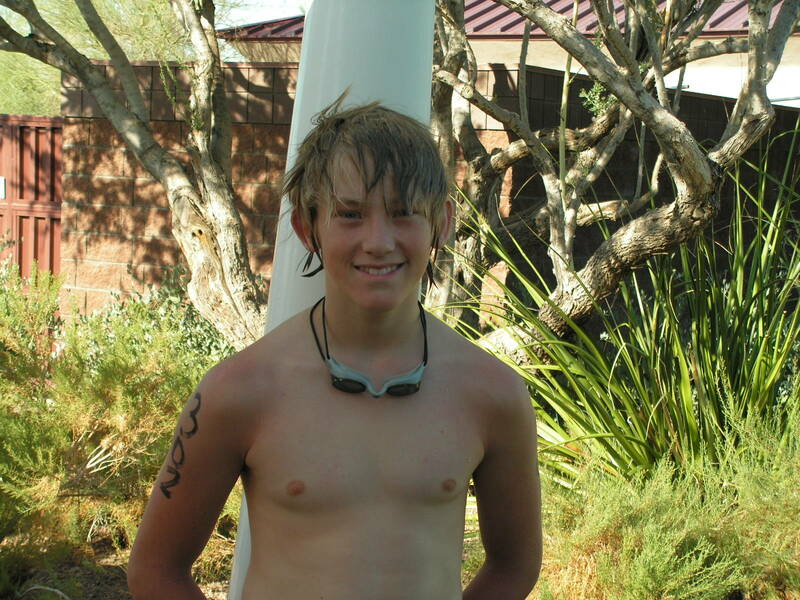 Yesterday was an exciting day for our just-turned-14-year-old son, Austin, the triathlon winner. A sports writer from our local paper came to interview Aus about his hockey to triathlon story. He said that he checked out the results from the race and he had to go up four or five age categories before Austin’s score was not in the top five! We didn’t know that. When Austin told him that just two weeks before the race he only knew how to doggy paddle, the guy was sold. The story will run next Wednesday (of course I’ll link the article here!) and he is also submitting the story to the major US triathlon magazine… which I don’t know the name of. I’m new to this triathlon deal. Just three weeks ago I thought triathlon was spelled triathalon. See, I’ve come a long way already. Ok, onto the horror of horrors that has had you gripped from the moment you read the title of this blog. About twenty minutes into the interview, a photographer shows up at the house to do a photo shoot of Austin. The first words out of his mouth were, “Is there a trophy room where Austin has his awards?” Well, yes there is. But it’s the boy’s room. The messy boy’s room. The room with clothes on the floor and unmade beds. I actually put my hands to my head and spoke the words, “Horror of horrors!” out loud, revealing my housekeeping secrets. Downstairs is sparkling clean. Past the middle landing on the stairs, you’re on your own, baby. Hard hats may be required. I have too many things to worry about like cooking, and laundry, and homeschooling, and gardening, and adopting, etc. to worry about the kids’ rooms being spotless. They didn’t even give me two minutes of grace time to throw things under the beds. The photographer was right on my heels going up the stairs. Without much shame, I started shoving, hiding, smoothing, throwing, moving, etc. We did get one-quarter of the room presentable in about five minutes. To calm my nerves, I had to leave the room while they took the pictures. Good grief. Don’t worry, my picture won’t be gracing Good Housekeeping anytime soon. The word is out, unfortunately. I’ve always said, “If you want to see me, come on over! If you want to see my house, please make an appointment for two weeks out.” See, it’s true!